Israeli (pearl) couscous is larger than regular couscous, giving it more flavor and texture. 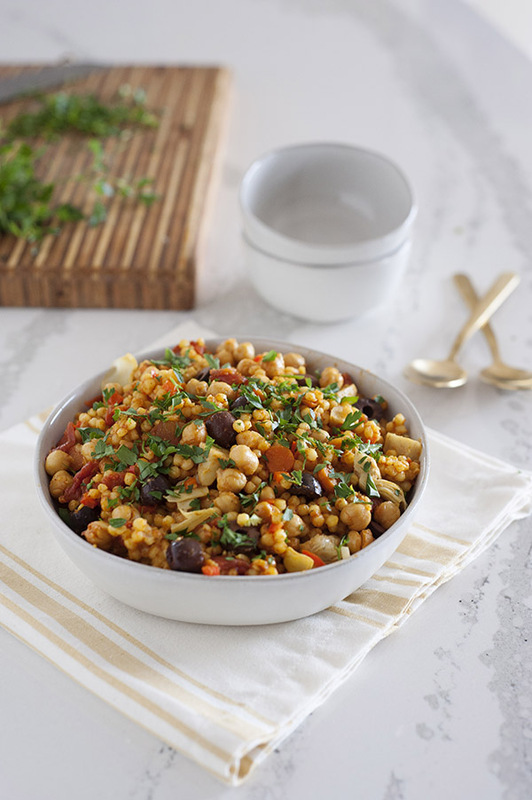 It is especially delicious in this One-Pot Sicilian Couscous dish from One-Dish Vegan made with chickpeas, olives, and an assortment of vegetables. Israeli (pearl) couscous is larger than regular couscous, giving it more flavor and texture. 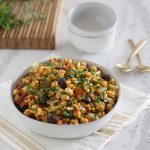 It is especially delicious in this Sicilian-spiced dish made with chickpeas, olives, and an assortment of vegetables. Heat the olive oil or water in a medium saucepan over medium-high heat. Add the onion, carrot, bell pepper, and garlic. Cook, stirring, for 5 minutes to soften the vegetables. Stir in the tomatoes, dried basil, saffron, and paprika. Stir in the chickpeas, couscous, broth, and red pepper flakes. Season with salt to taste. Bring to a boil and then reduce the heat to a simmer, cover, and cook for 10 minutes. Remove from the heat and let stand, covered, for 10 minutes longer or until all the liquid has been absorbed. Add the artichoke hearts, olives, and lemon juice and season with black pepper just before serving. Fluff the couscous with a fork. Sprinkle with parsley and serve hot. 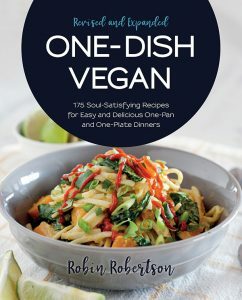 From One-Dish Vegan by Robin Robertson © 2018 Quarto Publishing Group USA Inc. Used with permission. Thank you, Janet. I’m so glad you enjoyed it!